I was actually not planning to attend the party but Jacques keeps on convincing me to attend because we met prior to the party. 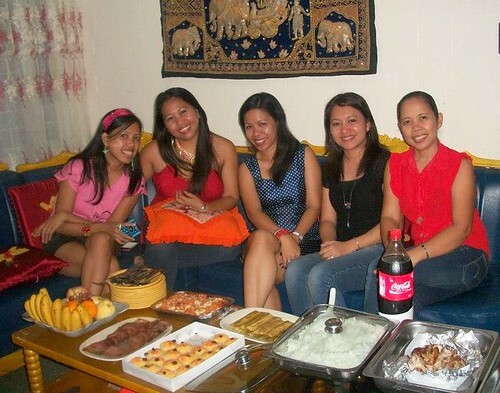 When we arrive at Mommy Grace house only me, Jacques, Judy and Mommy Emma are the guest. Sadly the others weren't able to join due health and family emergencies. However, that didn't prevent us to have fun. 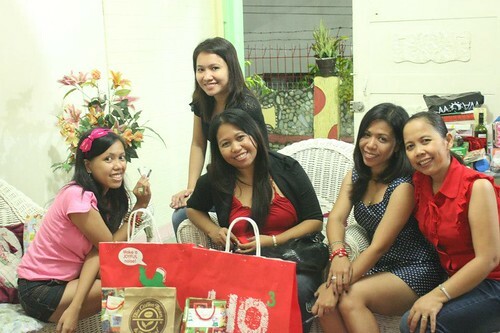 We had woman-to-woman bonding and chikkas. Jacques and I even got a lovelife encouragements from fellow married mommies. 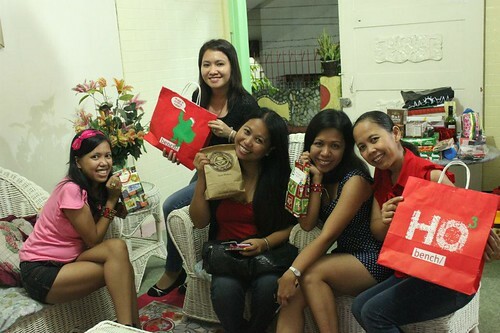 During exchange gift we also had a blast. 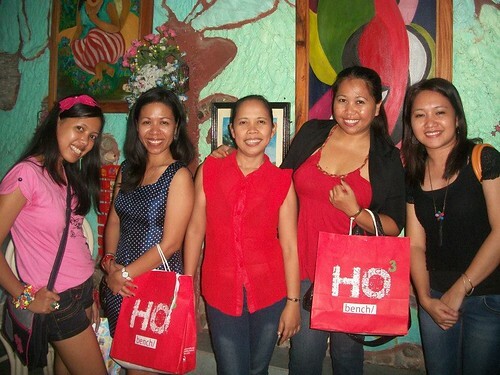 It was stated on the CDO Mommy Blogger Christmas Party event page that gift should be something wearable. And that something wearable wrap on my gift is a beaded handbag which mommy Grace now owning it. Mommy Grace gift was a victoria secret lingerie which was received by mommy Emma. 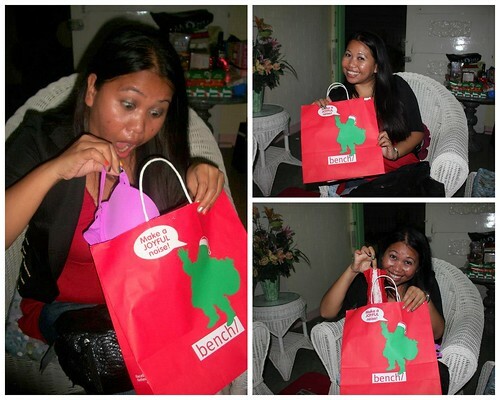 While giving gift mommy Grace exclaimed "Igu jud kaayo na sa imo!" which made us all laugh. Jacques received Judy's gift which is a bag. And Judy received the gift from mommy Emma but we exchange gifts because I received Jacques gift of which I already know whats inside. And we already agreed that Jacques and I should not received each others gift coz its no more surprising. 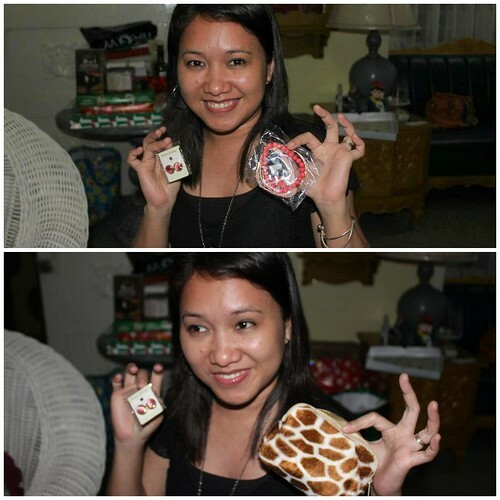 Good thing Judy's kind enough to switch gifts, which turns out a perfect swap in the end coz Judy love the pouch bag, bracelet and earrings on Jacques gift. 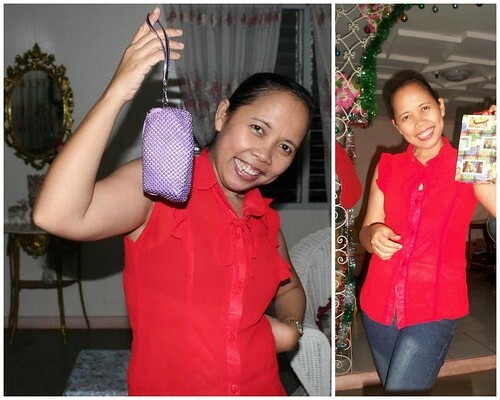 And I on the other hand received a fantabulous gift from mommy Emma of which Judy said it was indeed a perfect swap coz she doesn't see herself wearing it... :D Mommy Emma fulfilled some stuff Im eyeing to have; the sling bag and a colorful spike bracelet. 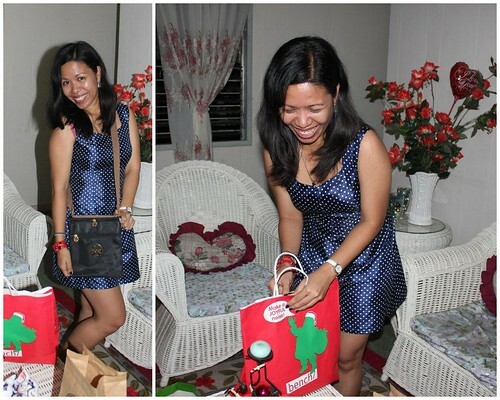 See that happy face while revealing my gift? I have longed to own this stuff but didn't really buy it for myself because I just thought its just a product of my fashion addiction that started to grow in me this year. You know the kind that "I want to have this coz its perfect for this outfit/get-up". Lol When I buy I always had that in mind. If I saw stuffs my mind will automatically have a mental check whats in my closet that will go with it. Do you have the same thinking? Excuse my outfit on that day... I was supposed to go grocery shopping and not to party, the reason I was in my everyday comfort fashion; short and t-shirt and no make up. 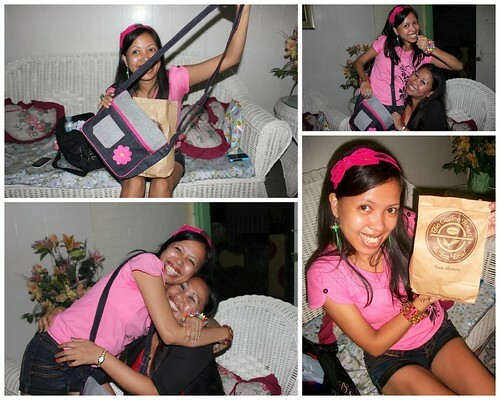 Photos from Mommy Grace and Jacques.